Stephanie Nagler attending the first day of my private one-on-one workshop. 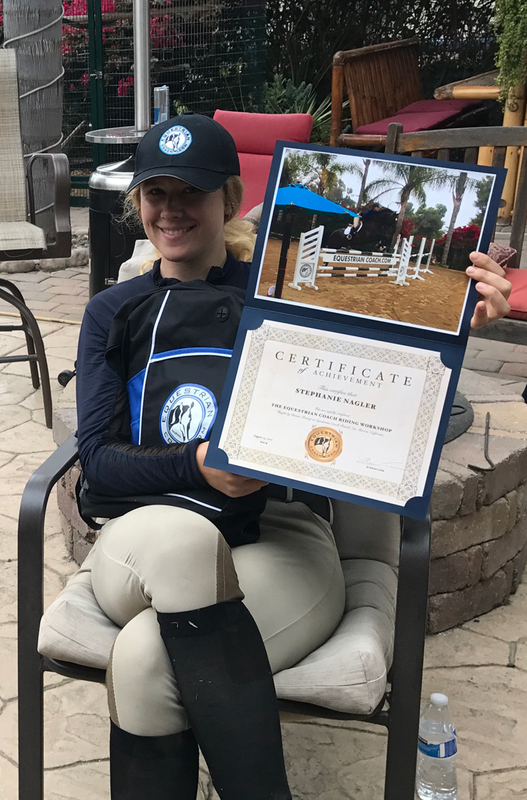 As one of the finalists of the USHJA Emerging Athlete Program, Stephanie was selected by the USHJA EAP committee to receive a scholarship to attend my private one-on-one workshop at my ranch in San Marcos, CA. We had a very successful first day! I asked Stephanie to tell us her story and her experience on day one of the workshop. Here is what she had to say…. Growing up in Santa Fe, New Mexico, opportunities in the hunter/jumper world were few and far between. My early years were spent with my mother teaching me on a series of horses that, though not conventional, were godsends in that they each presented new challenges, unique lessons, and taught me that one must first and foremost love one’s horse as an individual. When I was ten, I began as a working student for Caroline Stevenson and Sarah Invicta Williams. Caroline taught me that horses are never, ever throwaways. Sarah taught me that to get anywhere worthwhile you have to put in the hours, you have to believe you can do it, and you have to leave “What’s outside the barn, outside the barn.” It was under their tutelage that I started riding many horses a day and showing any and every horse I could get my hands on. I rode ponies, wonderful old hunters, and when I got really lucky, a Grand Prix horse or two. It was Sarah who initially suggested—no, demanded—that I apply for the EAP. At that point, due to financial and logistical issues, I no longer had a trainer, so when I was awarded the initial round of EAP with Melanie Smith Taylor, it was like manna from heaven. Throughout the training sessions at the initial, regional, and national levels, a breadth of knowledge and experiences were presented to me that I don’t think I could have gleaned anyplace else. From mucking, to feeding, to shoeing, to veterinary care, to experiencing the opportunity to ride with the best of the best; I began to fill in the holes so often left by today’s traditional training systems. I now work as an assistant trainer and rider for ChaCha Jago and there’s not a day that goes by that my experiences with the EAP has not proven invaluable to myself, the horses I ride, and the students I teach. 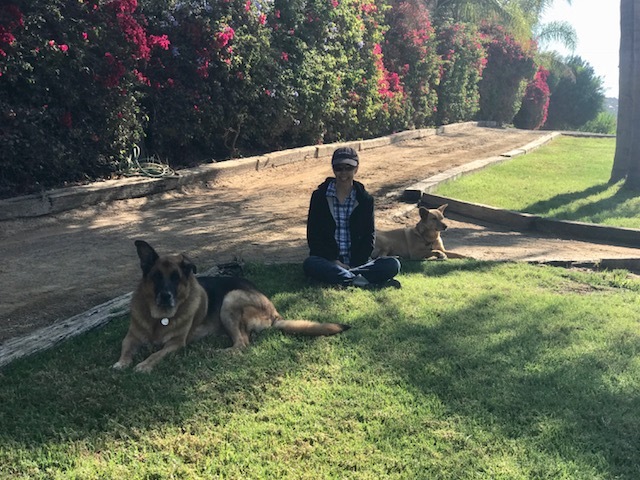 I think there are two reasons I was selected as the recipient of USHJA’s Bernie Traurig Scholarship. One is that, as I tried to make clear in my essay, for me, the horses’ welfare will always come first. And second, to have the opportunity to ride with Bernie Traurig is not only an opportunity to improve myself, but it is also an opportunity to pass on what I have learned to the horses I ride each day and the children I teach. To learn something for one’s self is wonderful, but to be able to then pass that along to others is priceless and builds upon itself in perpetuity. The competition, the coolers, and the blue ribbons are certainly what drive my “inner-competitor,” but ultimately it must be our responsibility and our passion to ask our horses to join us, as equals, in this remarkable and privileged sport. USHJA, Bernie Traurig, ChaCha Jago, and Gigi Caruso for lending me Chintan Z, a MOST magnificent mount. 10. You are never too good to make a simple mistake. 9. Help your horse by keeping it simple. 8. Practice does not make perfect. Perfect practice makes perfect. 7. Be friendly to your horse. He’ll return the favor. 6. Good riding is kind riding. 5. Mind this adage: As little as possible, as much as necessary. 4. Don’t rely on luck. Create your path. Create your distance. 3. You have to respect what your horse can and cannot do. 1. Above all, have an open mind. Today, as we delved into the basics of classical training of the jumper and equitation horse. 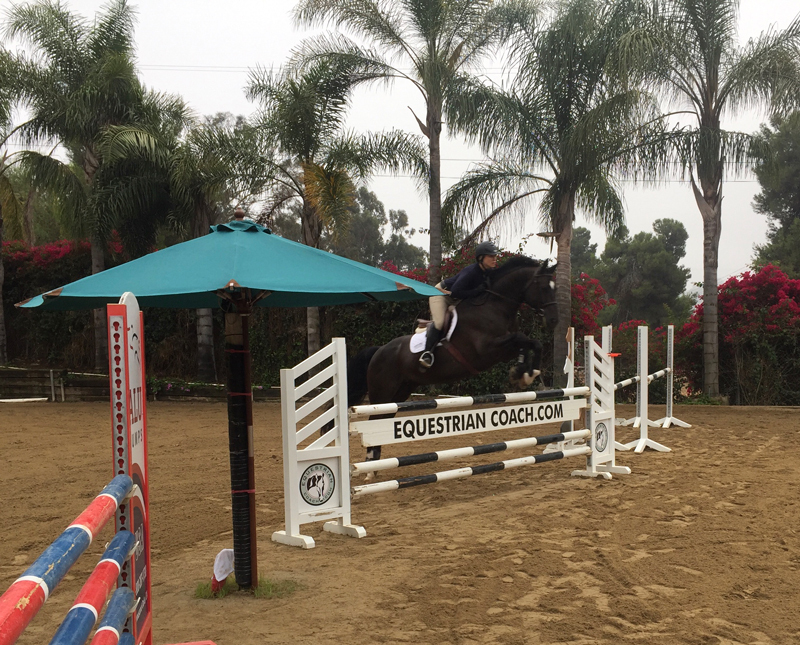 We explored step-by-step a series of exercises designed to perfect my aids, better attune my horse to my cues, and, ultimately, work methodically and effectively through the more demanding levels of show jumping. Below is an outline of the steps we took, the relevant reasoning behind the exercises, and personal meditations upon how they worked for me. A long and low warm up, though relatively brief, in order to awaken the horse’s and my body, without stress or undue pressure. Much like the initial stretches of a yoga session, I saw this as a wonderful opportunity for me to discover who and how my horse (and I) might be on that particular day. Lateral movements – shoulder-fore, shoulder-in, leg yields, and haunches-in (in order to balance the horse on the outside rein). Throughout these exercises, I found especially interesting and helpful Bernie’s instruction to always extend the horse, either at a rising trot or canter, after each lateral exercise. In my view, this allowed both me and the horse to relax a bit and re-center ourselves. I was reminded that one must always remember to breathe. A series of transitions between the working canter, medium gallop, and mild collection. In retrospect, these proved to be invaluable once we progressed onto the bending line segment of the lesson. A series of gymnastics exercises in which we built up from cavalleti a standard gymnastic line of a trot vertical to two oxers, with one stride in between. Of particular focus was keeping the horse very straight, with a slightly wide hand and a following release over each fence. Once again, this proved a valuable building block when it came to the addition of subsequent jumps. Adding on to the gymnastic line, Bernie then built a four and a half stride line, oxer to vertical. This raised the issues of managing the track and stride length for the first rounds and jump-offs, as well as setting up a track before the first fence so that the second fence would fall perfectly in rhythm. Also added to the initial gymnastics line and the four and a half stride line, was a rollback turn to a vertical, which further expounded upon the “three stride turn” exercise we’d worked on the previous day. For mere mortals, the idea of turning at a point where the horse has exactly three strides to take before the first fence is, for the record, extremely daunting. But, as I came to realize, it becomes amazingly doable with a great deal of persistence, grit, and determination. Our final exercise of the day revolved around my horse maintaining or changing to the left lead over the fence. Bernie explained the importance of customizing the exercise to the horse—in this case finding the height at which Chin Chin could comfortably and consistently land the left lead. He also mentioned the necessity of adjusting one’s aids to suit the moment (e.g. not using so much leading rein so as to throw the horse off balance). We worked up in height and complexity of turns and discussed the importance of trying to school issues over smaller jumps whenever possible, in order to save a horse’s legs the concussion of higher fences. The moral of the story—see Bernie’s Top 10 Pearls of Wisdom, Day 1 above. When schooling, build up slowly in height and difficulty. Ride the track along with the stride. Practice the basics over simple and small courses. Constantly remind yourself of the elements of style you need to improve. Disassemble a course into lines, tracks, and turns. Lesson 1: The course designer is NOT your friend. Lesson 2: Plan, plan, plan, analyze, analyze, analyze, think, think, think. Lesson 3: Different types of jumps will completely alter the way an identical line will ride. Ditto for the arena in which the course is set. Lesson 4: Your homework is to have been done AT HOME. In other words, when you’re in that warm up arena, you’re JUST making sure the horse is responding to your cues and moving off the aids. Lesson 5: Use the 45 seconds after the timer begins wisely. In other words, do something really intelligent like stroll by that potentially life altering liverpool. Lesson 6: If you’ve got a really good plan, stick to it. Lesson 7: When you’ve got a diabolical course, as I did, chant to yourself, “I am good enough, I am smart enough, and darn it I can do it.” Waging psychological warfare against one’s self can work wonders. Lesson 8: Beware of cultivating more impulsion than necessary. Lesson 9: A methodical, sane, level-headed rider makes for a methodical, sane, level-headed horse, which makes for a methodical, sane, level-headed, and CLEAN round. Lesson 10: Every course should have the poise, elegance, and grace of a winning equitation round. Lesson 11: Know when your horse has given his best and it’s time to call it a day. Lesson 12: Ask yourself how you can make your horse’s job easier next time. Lesson13: Always give your horse a pat and always tell him how much you love and appreciate him. They are saints, they give us so much, and sometimes we forget. Clinics are a unique opportunity to learn and experience things you wouldn’t have the opportunity to learn any place else. If you’re lucky enough to attend a clinic, pay attention to everything and everyone around you, because you’ll learn as much from watching others as you will learn from listening to what the clinician says about you. By that same token, if you’re lucky enough to be in a clinic, don’t be afraid to ask questions. It makes life more interesting for everyone. My clinic with Bernie was like that line from the Garth Brooks song, “The Dance” – “For a moment all the world was right.” And so, as I sign off, I say thank you, thank you, thank you, to Bernie, Cait, my fellow participants, and all of those who got me here. Click here to learn more about the EquestrianCoach Workshops next summer. 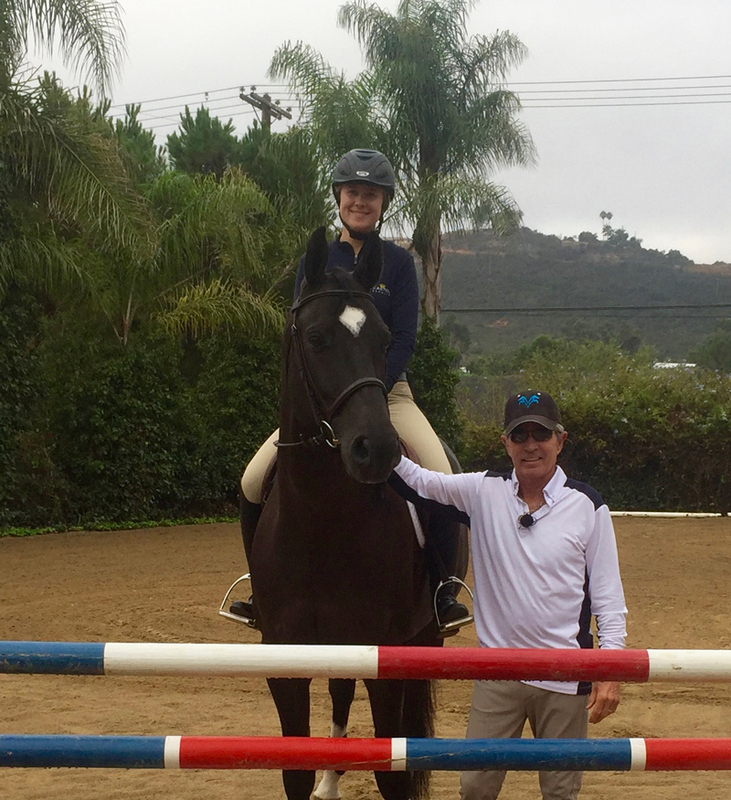 Equestrian Coach Riding Workshop Scholarship winner for 2014, Annah Douthat, shared her experience at the summer workshop with Bernie Traurig on our blog. In this journal, she discovers quite a bit about herself and her riding. 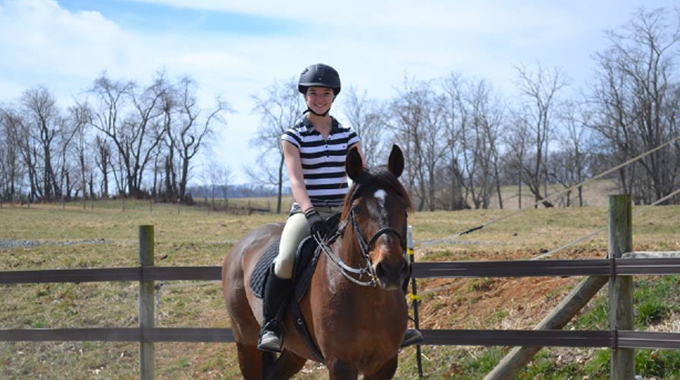 Read the insightful and detailed account of her experience and witness just how much a rider can learn in just 5 days!